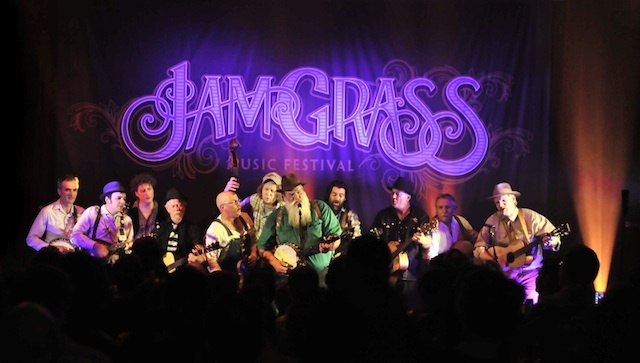 JamGrass Music Festival has announced further additions to the 2013 lineup. The first artist announcement in May made it very clear that this years 3-day extravaganza will be a Bluegrassy, Jamming Force. (very similar to “The Force” but with more banjo and mando solos). This second announcement confirms that the bluegrass, progressive bluegrass and jam scene in Australia is hot and the best acts in the country will be congregating in Melbourne in October. Mustered Courage will be joining the line-up for the third straight year. After announcing they’ll be one of the headliners for the first ever JamGrass ‘On The Road’ warm up party in Sydney this August, they will have been a part of every single JamGrass event. With their continuing success, national touring and outstanding Album launch in May, they are at the forefront of the progressive bluegrass scene in Australia. Multiple ‘Golden Guitar’ winning Davidson Brothers have been supporters of JamGrass Music Festival since its very first year but this is the first time they’ll be in the country to perform at it. They’ll be playing with their full band and based on their recent performances they are all playing at the top of their game. Bill Jackson Band is going to be a surprise standout. Known more commonly for his solo performances or being accompanied by Pete Fidler, Bill Jackson will be bringing his all-star band comprised of Pete Fidler, Shannon Bourne, Ben Franz and Bree Hartley to JamGrass. The Bill Jackson Band performed with a similar lineup earlier this year and thrilled an intimate audience of music lovers who have not stopped talking about it. We can’t wait to have Bill Jackson Band share their magic with JamGrass Festivarians. Brisbane based three-piece, The Rusty Datsuns (Qld) will make a stop at JamGrass on their national tour supporting their soon to be released album. Combining sweet vocal harmonies over a backdrop of deftly finger-picked guitar, banjo,ukulele and soaring fiddle the ‘Dattos’ live show has crowds dancing jigs and making merriment aplenty with their spellbinding performance. They’ll provide fresh take on modern folk with a healthy bluegrass twinge. Appalachian Heaven String Band is a lively, driving five piece string band, playing traditional old-time music from North America including the Southern Allegheny Mountains of West Virginia, Virginia, North Carolina, and Kentucky. Expect to be overwhelmed and uplifted as this heart-warming band with an ethos to always engage and entertain is a must see experience. He appeared as a special guest at JamGrass 2012, and Jimi is back to perform a full set as Jimi Hocking’s Blue Mandolin. Known for his blues guitar playing, Jimi’s love for the mandolin will see him right at home in the JamGrass lineup. The Morrisons (NSW) are one of the newest bluegrass bands to hit the Australian scene and are already making waves in Sydney. The sweet bluegrass country soul voice of James Morrison backed by some of Sydney’s hottest young string pickers are sure to be one of the new discoveries for JamGrass Festivarians. There will be one more exciting artist announcement to complete the expanded 3 day program from October 11-13. Tickets are expected to go on sale in the coming weeks. Professional videos filmed live at JamGrass 2012 are currently available on the festival’s YouTube channel at: www.youtube.com/jamgrassmusicfest.